Pigeon John joins forces with Quannum and drops his fourth album to date. 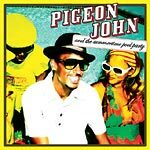 Whimsical sing songy laid back lyricism with that wit you've come to love from Pigeon Juan. There are only a few guests spots but notable ones at that! Brother Ali, RJD2 and Rhettmatic all stop by for the pool party ya'll! Producers: DNAE; Chris James; Pigeon John; Great Jason; DJ Rhettmatic; RJD2; Buchman; Nick Toth.